The launch of the sculpture residency program of Summer 2017 is generously supported by the Fulcrum Fund in partnership with the Andy Warhol Foundation for the Visual Arts and The FUNd at Albuquerque Community Foundation. Belonging – is a community-engagement, participatory project created and led by Christine Wong Yap. The artist will hold storytelling workshops with immigrant groups to elicit personal stories of place, home, and belonging. Christine and participants will create site-related place markers using excerpts of narratives and creative response activities created in the workshops. The project will result in a self-published ‘zine that records a map of the project. 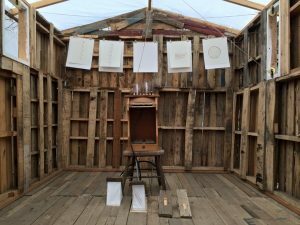 Alex Branch creates architectural musical sculptures from salvaged materials that dually function as gathering spaces for the communities in which they are built. The spaces she creates often serve as conduits for artists, writers and musicians to experiment with new work and foster collaboration. During her residency at the Sanitary Tortilla Factory she will build an acoustic boat which will have musical capabilities built into the body of the vessel. Throughout her 6 week residence, events and workshops will take place related to music, boat making, and the issues of water in New Mexico. 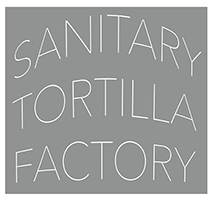 LAUNCH 1.0 / 1.2 is the first chapter of a residency project based at The Sanitary Tortilla Factory in downtown Albuquerque, New Mexico. It represents the beginning of what will evolve into a larger, long-term, artist residency program focused on sculpture. The curatorial team of Lucy Lippard and Bill Gilbert selected two artists to create six-week projects that emphasize key community engagement components. The program is sought proposals that incorporate waste stream utilization or engage the community via social practice projects. The artists are provided housing, travel funds ($500) and a stipend ($1500) for the residency. The emphasis of both projects art making process actively engage a particular Albuquerque community or communities. The artists selected for the residencies hope to expand the notion of what it means to work in a socially responsible manner. In preparation for this project, STF has positioned itself as a liaison between the visiting artist and local agencies/resources that are open to collaborating with artists. Both residencies will result in an exhibition and inclusion in a catalogue. The waste stream utilization residency offers the artist a direct access to over 200 tons of construction demolition. A full workshop and studio space are available for the artists in residence. The workshop contains a basic woodworking shop (table saw, band saw, miter saw, sanders), as well as hand held power tools and light metal shop including a TIG/MIG chop saw and grinders. Lucy R. Lippard is a writer/activist, author of 24 books on contemporary art and cultural criticism, most recently Undermining: A Wild Ride through Land Use, Politics and Art in the Changing West (2014) and Down Country: The Tano of the Galisteo Basin, 1250-1782,( 2010) as well as Mixed Blessings: New Art in a Multicultural America (1990) and The Lure of the Local: Senses of Place in a Multicentered Society (1997). Recipient of nine honorary degrees, a Guggenheim Fellowship, and a Lannan Grant, among other awards, she lives off the grid in rural New Mexico, where for 20 years she has edited the monthly community newsletter, El Puente de Galisteo. Bill Gilbert did his undergraduate work with Paul Soldner in Claremont, CA and graduate studies in Montana with Rudy Autio and Ken Little. He has served on the faculty in the Department of Art and Art History at the University of New Mexico since 1988 where he holds an Emeritus Distinguished Faculty appointment. Gilbert started the Land Arts of the American West program in 1999. He is co-founder of the new Art & Ecology emphasis in studio art and held the Lannan Endowed Chair in Land Arts of the American West from 2005-2016. In 2009, the University of Texas Press released Gilbert’s book with professor Chris Taylor entitled Land Arts of the American West. He served on the steering committee for the 2009 LAND/ART New Mexico project and authored the introduction for the culminating book LAND/ART published by Radius Books. In 2012, he received a five-year grant from Andrew W. Mellon Foundation to form the Land Arts Mobile Research Center.